Maifest celebrates the arrival of spring, nature’s bright reawakening after winter’s cold and darkness. Maifest (Mayfest) has its roots in one of mankind’s oldest traditions! 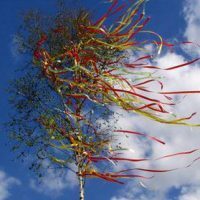 What was an ancient pagan festival eventually took on Christian religious significance, and has evolved to become a colorful, joyous part of European history and culture, with distinctive traditions like the dancing around the maypole. Its religious and superstitious aspects have long since disappeared, but Maifest traditions are still celebrated throughout Germany. During Maifest, cities and villages are bedecked with colorful drapery and flowers. Some areas light bonfires, while others open the carnival fair season and elect May queens and kings. 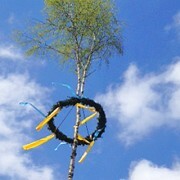 One tradition shared among most regions is the erection of a Maibaum (Maypole). The Maibaum may stand in the market place, in front of city hall or at individual residential houses. Maypoles may be stay up the entire month of May, or even longer. The Maypole and the dance around it is a singular symbol of spring’s reawakening of fruitfulness. A related century-old tradition is the robbery of decorated may trees at night from April 30 to May 1 — the same night of Walpurgisnacht, (“witches night”), celebrated in Germany, Eastern and Northern Europe with bonfires, lots of booze and dancing. Americans have enjoyed German folk fests for centuries in the merry month of May. Towns such as a Hermann, MO Strasburg, VA Brenham, TX Myrtle Beach, FL and Tulsa, OK have celebrated Mayfest since the early 1800’s. Much like in Germany, there is traditional dancing, food and, of course, the customary Maibock beer or May Punch. May is a perfect time to enjoy German breads, pickles, mustards, cheeses and hams! Some specialty food retailers even have special offers on German food at this time to coincide with Maifest. At Maifest celebrations the food is plentiful and beer and wine flow freely! A very popular drink is a “Maibowle” (May punch), a refreshing mixture of white wine, champagne and woodruff. In the Middle Ages, this drink was considered an aphrodisiac, and was consumed in celebration of fertility and the spirits of the forest. In the Middle Ages, this drink was hailed as aphrodisiac (perhaps these ages were not so dark after all). Sweet woodruff (Waldmeister is an old-world herb, that has naturalized in North America in zones 4-8. It’s a small plant with white blossoms that grows in the forested areas. In the U.S. this plant is widely available in garden centers and can be grown in a shady corner of the yard or herb garden. Woodruff should be harvested for flavoring only in May when the new leaves are tender. 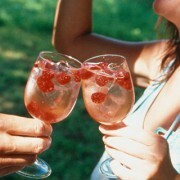 When it is cut up and soaked in wine it produces the distinctive May wine taste! Maibock, a German beer brewed only during Spring is another prime drink choice. Maiwein (May-wine) is a white wine flavored with fresh Waldmeister (sweet woodruff). This white wine is exported from Germany can be found in German retail stores in North America.